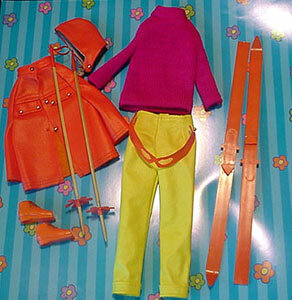 This is Barbie's Mod snow skiing ensemble, updated from Ski Queen #948 (1963-1964). The hood and jacket are separate. The jacket has flaps with gold bead buttons, three gold bead buttons down the front and raglan sleeves. The hood also has a gold bead button closure and gray lining. The matching goggles also have a gold bead closure on the back. The yellow vinyl pants do tend to stiffen up over the years. The fuchsia knit sweater can easily stretch out, especially around the hem.